Years: Mid 1990's - ? Shimano Dura-Ace Crankset FC-7700. 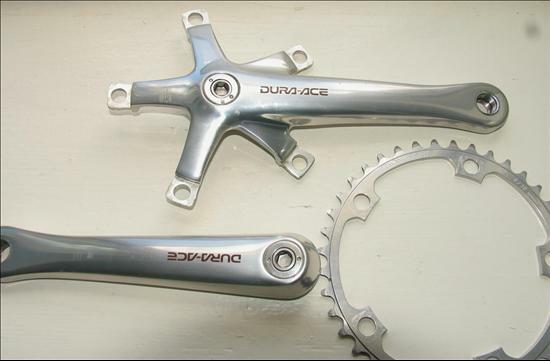 First version of the 7700 Dura-Ace Series (versions 7700 and 7701 cranksets). Details: Shimano always leads with Dura-Ace. In 1997, 9 speed was introduced. They kept with the shift cables coming out of the side of the STI levers and greatly improved the shift quality. Ultegra (600) and 105 followed suit. 9 speed uses the same freehub body size as 8 speed.